Cam's Cinematic Episodes: Film Review - HELLBOY II: THE GOLDEN ARMY: Make Way For The REAL Hell-Raiser! 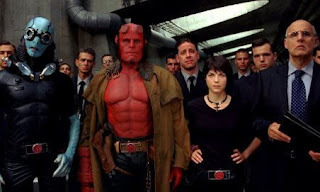 Film Review - HELLBOY II: THE GOLDEN ARMY: Make Way For The REAL Hell-Raiser! “It isn’t easy being green”, Kermit the frog famously stated. But it turns out that being red is no walk in the park, either. That’s just one of the many profound thoughts that crept into my head during my recent viewing of Hellboy II: The Golden Army. I also came to the conclusion that director Guillermo del Toro (Who previously birthed Pan’s Labyrinth) didn’t simply have a single monster in his childhood closet. No, he must have had an entire community in there. But instead of scaring him into a catatonic state, they have inspired the most thrilling and bizarre creations of adult fantasy (Not THAT type of fantasy!) in modern cinema. 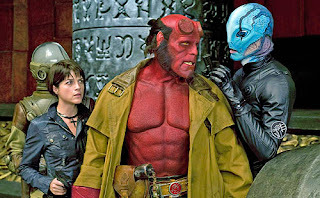 Hellboy II is lush with grotesque spectacle, and follows in the proud tradition of Spider-Man 2 and X2: X-Men United as comic-book sequels that far outdo their introductory instalments. As you may or may not recall from the original Hellboy, the title character is a demon, escaped from another dimension, who got a lift into our universe courtesy of a Nazi super natural portal experiment. 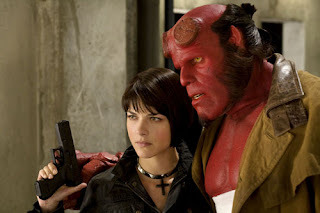 As played, under truckloads of red make-up and prosthetics, by Ron Perlman, Hellboy is a gruff, wise-cracking tough guy with a fondness for candy bars, beer, cats and Selma Blair. A card-carrying member of The Bureau for Paranormal Research and Defense (BPRD), a secret government task force trained to combat otherworldly trouble-makers, our horned hero frequently finds himself knee deep in ectoplasm and demon drool. Fortunately he isn’t alone, and can count on the aid of his BFF Abe Sapien (Doug Jones), a mastermind fish-man, as well as combustible lady love Liz Sherman (Blair). 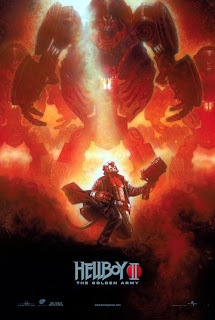 Hellboy II: The Golden Army picks up shortly after the events of the first film, with Hellboy and Liz now uneasily l iving together, and BPRD bureaucrat Tom Manning (Jeffrey Tambor) trying desperately to keep a lid on his attention-hungry horned avenger. His solution is to add a new team-leader to the unit, a stubborn German gas cloud, contained within a mechanical suit, named Johann Krauss (Voiced amusingly by Family Guy creator Seth MacFarlane). 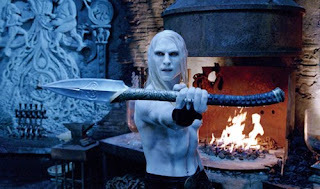 However, a deeper threat lurks in the form of the Elvin Prince Nuada (Luke Goss), a blonde Marilyn Manson clone, who has grown tired of mankind’s disrespect for his race and aims to settle the score. His methods range from releasing a swarm of man-eating “tooth-fairies” in an auction-house, to a giant tentacle-like plant monster in downtown Manhattan. His ultimate goal tho ugh, is to retrieve the three pieces of a magical gold crown which will give him control of the mighty Golden Army, a massive squad of indestructible robotic warriors who will allow him to rule the free world. Unfortunately for our petulant Prince, his twin sister Nuala (Anna Walton) has escaped with the last piece and found shelter with our lovable team of mystic misfits, who are now charged with the task of pulling humankind back from the brink of certain doom. *Whew*. 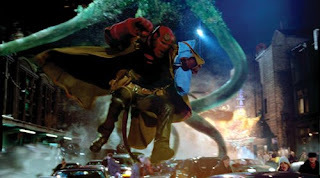 Anyhoo, as an exercise in summer action dynamics, Hellboy II is a welcome addition to an alre ady over-crowded marketplace. Not content with merely delivering explosions, del Toro has actually done something fairly unique: he’s managed to create an intimate personal film that still manages to exhilarate and amuse. Pay close attention to the climax of the monster plant attack scene. After we get all the requisite creature-feature stuff there is a moment of stunning beauty and poignant solemnity that is a far cry from the turbo-charged inanity of Wanted or Hancock. This is a film where the effects are used for the actual purpose of story-telling, and we see some amazing sights: the aforementioned “tooth fairies”, Death (with wings coated in penetrating eye-balls), a majestic rock organism that provides a subterranean passage for our heroes and a remarkable Troll Market sequence that is on par with the Star Wars’ Mos Eisley Cantina scene. At the center of it all are our fearless, yet strangely human, heroes. Perlman’s Hellboy continues to be an extremely compelling lead beast, with Blair a wonderfully moody fo il. But the true star here is Abe Sapien. His romantic relationship with Princess Nuala is the real heart of Hellboy II, and what pushes the film past its genre boundaries. There is a drunken heart-sick chat (and Barry Manilow sing-a-long) between the gilled intellectual and Hellboy that is riotously funny. 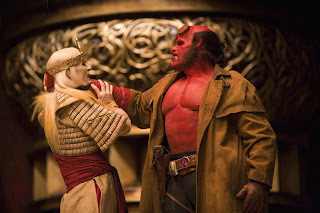 Indeed, Hellboy II is packed with witty character-driven comedy that had my audience erupting in thunderous gales of laughter. Through it all, we have Guillermo del Toro, the madcap master of the mythical, peering through ever y frame and grinning ear-to-ear. Hellboy II: The Golden Army is the best carnival ride of the summer, an idea-driven odyssey through the realms of the uncanny, and a tribute to the very best that the human imagination can conjure. Who says magic can’t exist past childhood?